HIPPITY HOP THE EASTER BUNNY IS ON HIS WAY! Our favorite Bunny will arrive April 5th! 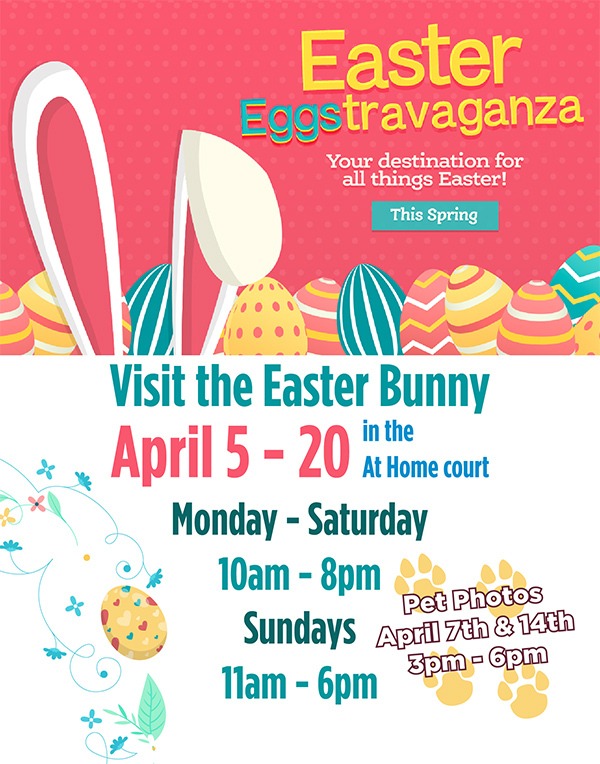 Photos and visits are available with the Easter Bunny daily April 5th – 20th in the At Home Court near the children’s play area. Pet Photos with the Easter Bunny: 2 special days have been set aside for Pet Photos with the Easter Bunny! Bring your favorite pet on Sunday, April 7th & 14th from 3:00pm -6:00pm; and capture the moment with a photo! *Please have your pet on a leash or in a carrier.